In tight economic times, some brides have been turning to Chinese-run wedding gown websites that sell knockoffs of famous-maker gowns. Not all women have reported bad experiences, but hundreds have. And when "GMA" went undercover and ordered some wedding gowns and bridesmaid dresses from these sites, they were not the stuff dreams are made of. But there ARE safe, smart ways to save on wedding gowns. Buy used. 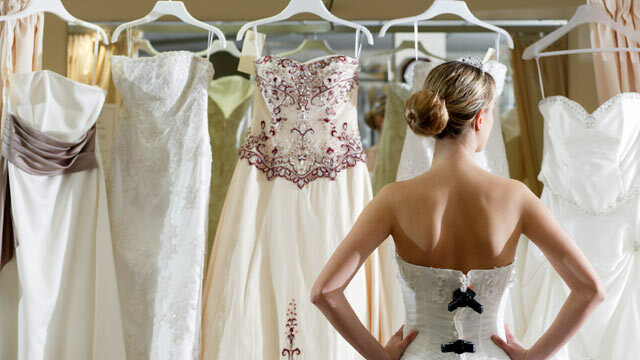 It may not sound romantic, but you can get a used gown for 30 to 90 percent off. And, unlike other clothing, it was probably only worn once. Here are some websites that specialize in secondhand gowns: Click HERE, HERE and HERE. Rent a dress. It's not very romantic, but it is possible to rent a wedding gown. A fabulous one. Since you only wear it once, keep an open mind! Borrow a dress. Ideally a family member has a dress you can borrow and even update. Borrowing from a friend whose dress you admire is also possible. Worried about guests recognizing a repeat? Borrow from a friend of a friend! Have your dress made. Check into local dress shops and seamstresses who make wedding gowns. They can emulate a gown you admire, or you can combine features from several you like and the price, though not rock bottom, will be lower than that of a designer gown. Search online. Local bridal shops make their own markups on gowns. Search around the country and see if you can find a genuine designer gown sold by a shop somewhere else where the markup is lower. Last-season sales. Many bridal shops sell last season's designs or even the store's fitting sample at discounts of 30 percent or more. Run with the brides. Yes, Filene's Basement made it famous, but some other retailers now also host wedding gown sale days where brides and their bridesmaids try to elbow out other teams to snag designer dresses for a song.